When one woman in an impoverished community looks to get others to help her claim her prize, hilarity ensues. On the eve of Quebec’s Quiet Revolution, while women still lived in poverty and under the thumb of the Catholic church, Michel Tremblay wrote his now-famous play, Les Belles-soeurs. This Canadian classic, that Gateway bills as “Fifteen Women. One Raucous Romp,” commemorates the reality of women of all ages and stages whose lives were dictated by the poverty of an underclass, as the Quebecoise were, and dictated by the rules of the Catholic church. Just as Ireland is rapidly moving from a theocratic state, so too did Quebec in the 1960s. With humour, passion and some music, Tremblay’s Les Belle-soeurs shows us what the Quiet Revolution left behind and why the radical change was so needed. Written just as the Quiet Revolution was starting in 1965, the play was an instant hit in Quebec. 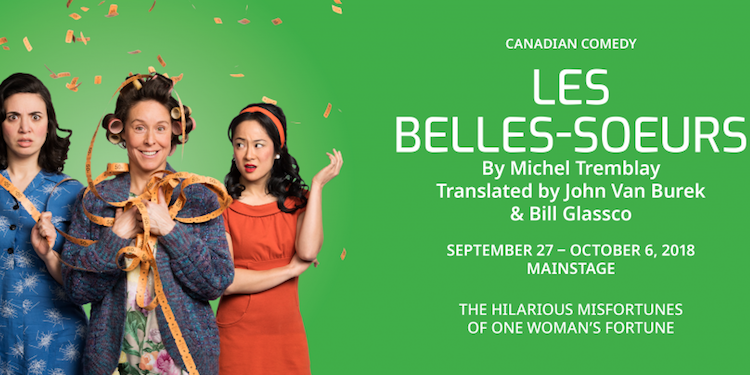 Once translated and performed in English, Les Belles-soeurs became a Canadian classic. Richmond actress and Langara Studio 58 grad Beatrice Zeilinger plays Rose Ouimet. “My first thought when I got the part was that I was excited to work with Diane (award winning director, Diane Brown) again because I’ve worked with her a number of times in the past decade. It’s a big cast. There’s a fine group of actors and production artists involved in this production,” Zeilinger says. Les Belles-soeurs “talks about oppression, these bleak lives of these extremely Catholic women, these contained lives they live, lives limited by religion and the mores of the day and by their class and education or lack thereof,” she says. In fact, most people think of it as a comedy. It is an example, to use broken Latin, of In Humour Veritas. Les Belles-soeurs, produced by Ruby Slippers Theatre, the first presentation of Gateway’s 2018-19 season, begins Sept. 27 and runs until Oct. 6, 2018 on the main stage. Saying this play will resonate with people of all ages, Zeilinger says it represents a not-too-distant past, part of our Canadian history, told in a very personal way with great, wry humour. “And, it’s not on for very long so don’t dilly dally,” she says. Gateway’s show last season, about a woman’s life in rural Canada, Beverly Elliott’s “Sink of Swim,” quickly sold out for the entire run. Tickets for Les Belles-soeurs can be boughtonline, or in person at the Richmond Gateway theatre box office 6500 Gilbert Rd., in Richmond.